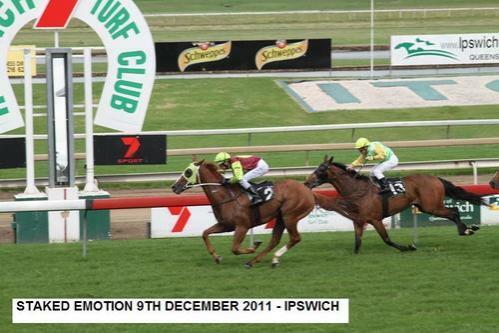 Staked Emotion (by Skalato) has his break through win at Ipswich today in a Maiden over 1350m. After a few early setbacks in his career trainer Matt Dunn has done a wonderful job to get him back to the races in winning form. Ridden a treat by Glen Colless he peeled out at the top of the straight to win eased down on the line. A big congratulations to Eleanor Barns a long term employee of Parador Park who bred the horse and showed confidence sending her mare to our stallion Skalato and retaining an interest in him. Also congratulations go to our other fellow owners Stuart Coleman, Mark Crocker, Renae Kingston, Shaun Pearce, Robert White, Steve Wilson, Lachlan Small and our Combo 33 partners.